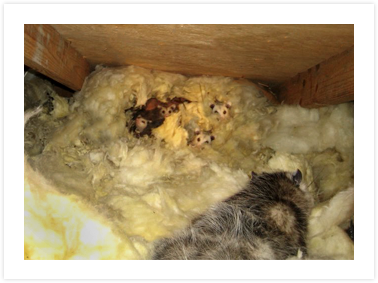 Stored-product pests are usually brought into the home in an infested package of food. Initially, infestations are easy to overlook because the insects involved are quite small, especially in the egg and larval stages. Often the first indication of the infestation is the appearance of small moths flying about or the presence of beetles in or near the found package. Identification and Life Cycles: Adult moths and beetles are easy to distinguish from each other, but their larvae are a little more difficult to identify. Use a hand lens to examine the legs of the larvae. Beetle larvae are grub like and legless or have only 3 pairs of legs, all located close to the head. Moth larvae have 3 pairs of true legs, plus additional leg like structures further down the abdomen. 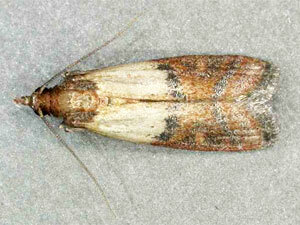 Both larvae and adults of beetles feed on foodstuffs, whereas only the larvae stage of moths consumes stored products. Meal Moths: Indianmeal moth – All damage is done by the larvae, which attack a wide range of products, including cereal and cereal products, flour, cornmeal, rice, dried fruits, dehydrated vegetables, nuts, chocolate, candies, and other confections. When infestation are heavy, mature larvae can often be found in parts of the house far from the original food source because they move quite a distance to pupate. The Indianmeal moth is a fairly distinct small moth with reddish brown forewings that have a coppery luster on the outer two-thirds and are whitish gray on the inner or body portion. The female moth lays its eggs singly or in groups on food material. Eggs hatch within a few days into small whitish caterpillars. Larva of the Indianmeal moth spin a web as they grow and leave behind silken threads wherever they crawl. When fully grown, the larva is about ½ inch long and white with a greenish or pinkish hue. This larva spins a silken cocoon and transforms into a light brown pupa, from which the moth emerges. The Indianmeal moth takes about 6-8 weeks to complete egg, larval and pupal stages during warm weather. Pantry Beetles: Adult beetles have oval bodies that are about 1/8 inch long with a brown and yellowish pattern on the wind covers. Female beetles lay up to 90 eggs within the infested food. Larvae emerge and feed on the food. Larvae are about ¼ inch when fully grown and have numerous stiff setae, or hairs, that emerge from dark-colored plates on the last few segments of their abdomen, as well as a tail of long thin hairs that extend from the tip of the abdomen. They are very active and seek out new food sources to infest. In warm temperatures, the entire life cycle from egg to adult can be completed in 45 days. The setae of this beetle are shed within the infested food product and can be irritating to the mouth, esophagus, and digestive tract if they are ingested. 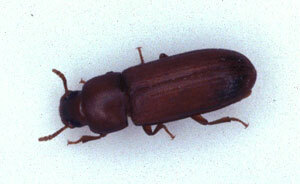 Food found infested with this beetle should be discarded. Damage: Pantry pests damage food by contaminating it with their bodies and their by-products. The larval stage of the Indianmeal moth produces frass (excrement) and webbing, and some beetle larvae produce secretions that give food a disagreeable odor or taste. Hairs from the warehouse beetle can irritate the mouth, throat, and stomach of people who eat infested products. In addition, pantry pests might introduce microbes into the food that could produce mycotoxins, especially if the food is stored in warm, humid conditions. Management: Getting rid of food infesting moths or beetles takes continuous, persistent effort if the infestation has been present for a while. Some pests are capable of living for many weeks without food, thus the threat of re-infestation exists until they die off or are killed. Follow the guidelines for removing and cleaning up an infestation. It is best, at least for several months after eliminating the infested products, to store any susceptible food in airtight containers, or in a refrigerator or freezer. Also, as a general practice, storing infrequently used food items. (e.g., pancakes, flour, grains, spices) in the freezer prevents infestation from developing. Detection: If you see small moths or beetles crawling or flying around your kitchen, look for the food source of these pests and remove immediately. If you locate the food source before it spreads to other packages, control may be easy. The source is commonly a package damages at the store or an opened one that is little used or forgotten. The best thing to do with the package is seal it up and dispose of it, removing it from the house immediately. Cleaning up an infestation: Most commonly, by the time the insects are noticed they have already spread to other food packages. Carefully inspect all packages, especially those that have been opened or exposed. Destroy any that give the slightest indication of infestation. Other than the insects themselves, telltale signs include webbing in tight places of a package or tiny holes in the container. Insects are less likely to invade packages that have their original seal, but more commonly infest those that have been opened or have been on the shelf for a long time. Before replacing non-infested packages, wash shelves with soap and water, and scrub corners and crevices or vacuum them with a crevice attachment to remove eggs and pupae. Prevention and Sanitation: Most home infestations of pantry pests maintain themselves on spills in the crevices of cupboards and drawers or opened packages of food stored for long periods of time. Following a few general guidelines when storing food products will help you avoid many potential problems. Do not put exposed food on shelves. Place it in containers with tight-fitting lids. Plastic bags are not adequate. Regularly clean shelves, bins and other locations where there is any possibility of flour or other food particles accumulating. Certain pests need only small amounts of food to live and breed. Soap and water is great for cleaning flat areas, and vacuuming with a crevice attachment will help clean cracks, edges, and corners. Do not mix old and new lots of foodstuff. If the old material is infested, the pest will quickly invade the new. Do not purchase broken or damaged packages of food materials. They are more likely to become infested. Construct storage containers so they are tight and can be cleaned easily. Store bulk materials, such as pet food, in containers with tight fitting lids. Some pantry pests breed in the nests of rodents and insects and may migrate from these into homes. Eliminate any nests found in or near the home. Pantry pests can also breed in rodent baits. Be sure to quickly check and discard infested baits.